You are browsing the archive for Force on Force. Great game last week over at Evesham thanks Paul for arranging. I thought I would post up my Pic’s from the battle. As the valiant defenders of the town take a stand against an incursion of Russian invaders. Our forces deploy in the centre unsure of where the Russian barbarians would enter. The Russians in their tin baths rolled in from the eastern end of town. Our forces had planned for this and let fly with RPG’s destroying the first APC and killing all it’s occupants. 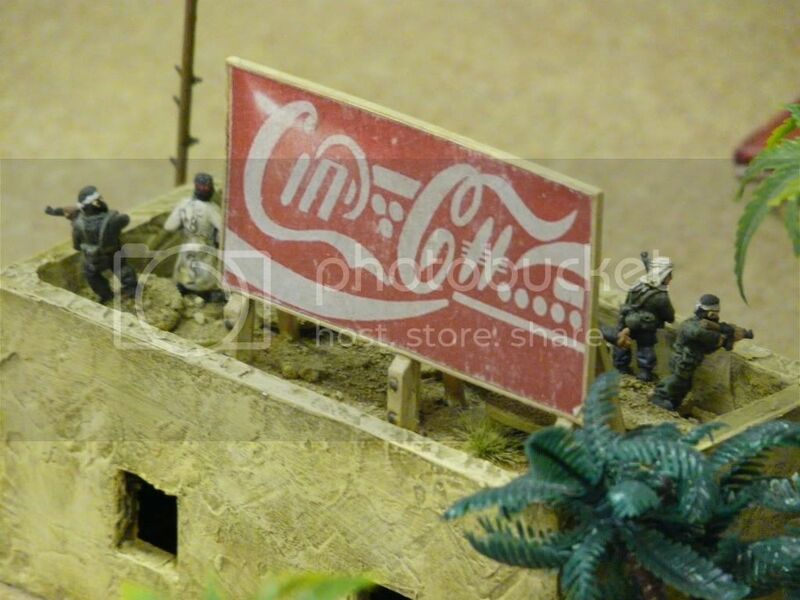 Defenders of the faith sponsored by Coke. The Russian Invaders halt after seeing their comrades killed and seek the cover of local buildings. As our front line forces seek cover from the occasion small arms fire from the Russians. Reinforcements head into town to turn the invaders back. Another great victory for our valiant forces…..
Stay tuned for regular updates from your unity government backed TV channel. Propaganda is our tag line. We have been playing Ambush Alley for a couple of years, despite Force on Force coming out earlier this year we still having managed to play them. The rules have many subtle differences which often only come out after a first play through. Rather than use the US Marines, we used the Russian Motor Rifles with their BTRs. The scenario saw irregular troops in control of the town and the Russians needing to neutralise them. The irregular troops start on the table, the Russians played by Dane are given a choice of where to enter the table. They take to the rooftops but fail to seize the two highest buildings. They wait for the Russians with their RPGs and machine guns ready. 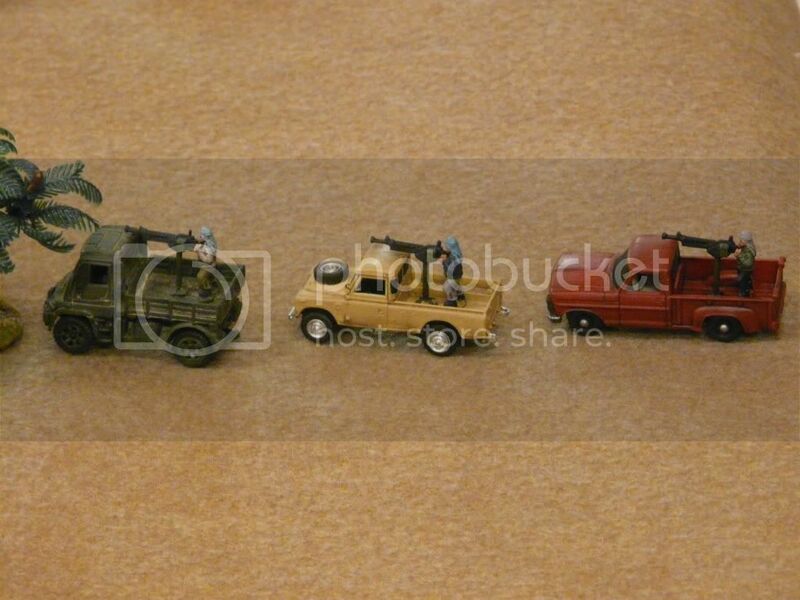 The Russians choose to come on to the table together, mounted in their APCs with only the lead commander exposed. The commander needs to pass a morale check to stay ‘unbuttoned’ which he promptly fails and drops down dropping the hatch shut as he goes. All Russian reaction checks are now at a penalty. There then follows some extremely complicated interrupting which we made far more complex than needed and a RPG was launched at the lead vehicle. Here’s where we got the rule really wrong, misrolled the result which showed an exploding vehicle, killing the occupants. Guess that’s a lesson – don’t drive through a hostile city without infantry support. Russian infantry do the sensible thing and dismount. Taking up overwatch positions the BTRs probe further into town. The high ground serves the Russians well forcing their opposition to gather out of sight. From their high ground on top of the general store the Russians poured effective fire on to their opposition. The BBC were present to film the skirmish. 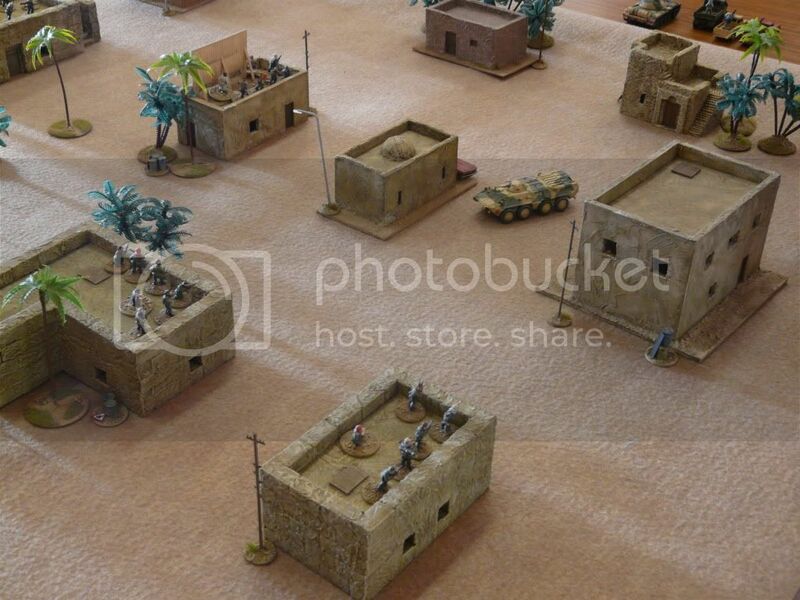 As the APC burned the Russians traded fire with the irregulars, driving them from the rooftops. Alas photography failed at this point, a group of technicals ended the board but came under fire and being softskins lacked any armour, this largely ended their role in the game. 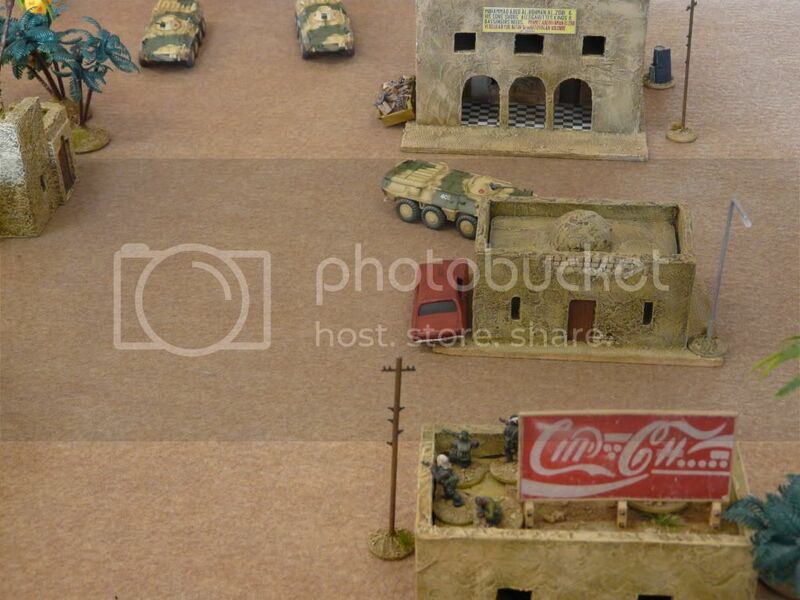 A pair of hummers entered the table and immediately came under fire, the vehicle was destroyed and this may well prompt a further game as the US Marines seek to mend their damaged pride. Well it’s November all ready! Tonight’s club saw Flames of War, LoTR and Force on Force. Stu and I took control of the forces of Sauron to defeat the forces of Gondor, to be frank it all got a bit messy, sorry Mark and Mark. The table and opposing forces. Hopefully soon we shall have a couple more contributors to the Blog, a Wild West game report from Mark and FoW games from Andy.